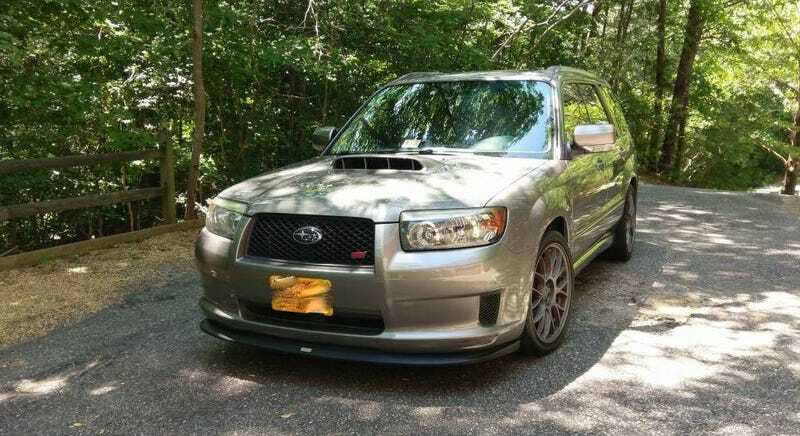 At $16,000, Could You See This 2006 Subaru Forester For The Tease? Imitation is said to be the sincerest form of flattery, and if that’s truly accurate then today’s Nice Price or Crack Pipe Forester is as earnest as Wilde’s Jack Worthing. That’s because it’s aping the JDM STi edition. We’ll have to decide how sincere the seller is about its price. Huzzah! Yesterday’s 1983 Mercedes Benz 380SE, with its meager $2,000 asking price won a spectacular 93-percent Nice Price win. That was despite a few niggling bothers, the greatest of which was probably the U.S. registration of a Canadian import that was originally a European import. Still, that was a lot of car for the cash. You know, the alternative to importing a car not originally deemed so worthy by its maker is to replicate it using parts on hand. That’s an easy peasy lemon squeezy way to have your cake and eat it too. Mmmm, metaphorical cake. The seller of this 2006 Subaru Forester XT Limited has, to a certain extent, eaten the cake. He’s updated and upgraded a number of the car’s components to create an American analog to the JDM-only STi edition. How’d he do? Pretty well, I’d say. The home market hot wagon offered a 265 horsepower turbocharged and intercooled 2.5 pancake under its be-scooped bonnet, 55 more than this XT’s original specs. This one now rocks a number of mods, notably an STi manifold, TGV delete and a bunch of WorxTuning intake/intercooler parts to ramp up the ponies. The end result isn’t revealed in the ad, but you can assume it’s somewhere way north of the XT’s original 210. The ad does note a ton of maintenance work done on the mill within the last 20K. That included the timing belt, which is a big deal on an interference engine like this. Behind the pressurized four sits the stock—albeit rare for the XT model—five-speed stick. The seller even notes this as preferable to the six speed in the JDM STi owing to its lower weight. Yeah, maybe so, but the general rule of thumb—and I’m all thumbs—is that more cogs generally means more fun. The suspension gains a good bit of STi-ness as well, rocking that model’s forged alloy control arms and lateral links. There’s also an STi steering rack, KYB struts, and fatter anti-sway bars. Brakes are Brembos in front and STi in back, and all of them painted red to stand out against the sweet Homura wheels. The bodywork gains some JDM STi bits too, while inside there’s WRX sport seats and an STi-badged tiller. The steel grey over black color scheme is subtle and classy, and is described in the ad as looking like a 2-year old car. The pictures bear out this description showing no apparent flaw either outside or in. A clean title and pampered history completes the package, and only the apparent oversight of detailing total mileage prevents the ad from sticking the landing for this custom Subie. Considering its condition, how great could those be? Why you might ask, would someone who has taken such great care in creating so special a car want to then sell it? Well, the answer is simple: his wife is driving him to do it. In the ad he notes that he is car-rich and needs to clear out a space in the garage for his better half, or as we say in my household, she who must be obeyed. That freed-up garage space will cost the seller his beloved Forester, and its new owner a cool $16,000. We now need to decide if that’s an equitable trade. What’s your take, does this custom STized wagon feel worth that kind of cash? Or, is this a Forester priced to be forgettable? Richmond, VA Craigslist, or go here if the ad disappears. At $2,000, Could This Euro-Spec Import 1983 Mercedes 380SE Find A Way Into Your Heart?